The mainstream news media have offered the American public a divided view of how information technology influences society, according to a new study by the Pew Research Center’s Project for Excellence in Journalism. Over the past year, messages about the promise of technology making life easier and awe about new gadgets have vied in the news with worries about privacy, child predators, shrinking attention spans and danger behind the wheel. These are some of the findings of the PEJ study of 437 technology-related stories appearing in the lead sections of 52 different news outlets: front pages of 11 newspapers, three cable and three network news channels, 12 websites and 10 radio programs. The study was designed to examine the media coverage that occurs when technology news crosses beyond technology-oriented outlets or news sections to the top of the American news agenda—to front-pages, the national nightly news, cable prime-time and other general interest news outlets. It did not delve into specialty publications or sections. The second-biggest storyline addressed a more positive development: the launch of the latest Apple iPhones. Attention to the release of the iPad was not far behind. While the mainstream press had a split vision of technology, social media reflected a different set of attitudes. An examination of blogs, social media sites and Twitter posts found more excitement about technological advancements and the businesses behind the developments. And the concerns, when there were some, focused on obstacles to technological freedom, such as pending court cases, which might get in the way of progress. The study also examined which technology companies generated the most media attention in these venues. Apple, with its flashy press events and often drawn out releases of new products, narrowly outpaced Google in total coverage. Twitter and Facebook ranked third and fourth. Microsoft, on the other hand, once the feared technology behemoth, fell far behind—attracting just a fifth of the coverage of Apple and less than half that of Twitter. The mainstream media’s coverage of technology was not vast. It made up less than 1.6% of the total coverage over the course of the year, ranking it 20th out of the 26 identified topics. That puts technology news in same range as the environment, sports and education. And while it trails far behind crime (4.7%), it comes in ahead of religion (.6%) and immigration (.9%). The topics within technology coverage varied widely, but the largest number (18%) concerned stories about social change and cultural trends—how technology is changing our lives. Those were closely followed by reviews and announcements about new consumer devices (16%). 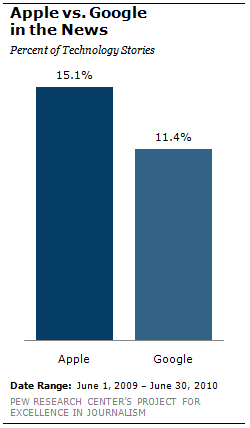 Policy issues under debate saw less coverage (12%), as did corporate goings-on (9%). The study also identified eight underlying themes about technology evident in the coverage, from its empowering affect on citizens to its destructive affect on our attention spans. Most stories (57%) conveyed one theme or other. When those themes are taken together, positive themes about technology narrowly outweighed negative (30% versus 27%). Beyond the top two themes—that technology makes life more productive and that the internet is unsafe—other themes were much less common. Technology’s empowering effect on citizens, for example, emerged in just 3% of the stories and its negative effect on human interaction in just 2%. The portrayal of technology companies, on the other hand, was generally positive. For Apple, the most heavily covered technology company, 42% of the stories described the company as innovative and superior, and another 27% lauded its loyal fan base. But there were doubts. The most common such negative thread, that Apple products don’t live up to the hype, appeared in 17% of stories about Apple. For Google, the company’s advancements in making content easier to find topped its coverage at 25%. But it was only half as likely as Apple to be framed as having superior, innovative products (20%). On Twitter, where posts gravitated more than in the mainstream press toward insider technical news like gadget announcements and business acquisitions, Twitter itself was by far the biggest draw. Apple still garnered more attention than Google, though. And while Microsoft still came in behind Twitter, Apple, Google and Facebook, the gap was not nearly as big as in the mainstream media. 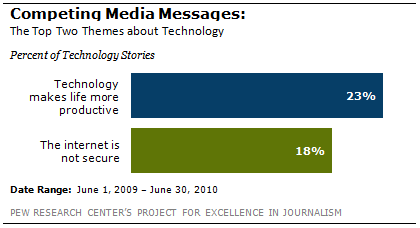 On blogs, technology overall drove less of the conversation than on Twitter. Over the 13-month time period, just 11% of the top linked-to news stories each week related to technology, versus 51% on Twitter. It was here, though, that Google finally garnered more attention than Apple. The findings suggest that in the mainstream media, particularly on front pages and general interest programs, the press reflects exuberance about gadgets and a wonder about the corporations behind them, but wariness about effects on our lives, our behavior and the sociology of the digital age. Social media, on the other hand, suggests that people who are on the cutting edge of technology are not only more interested in discussing the topics, but more positive in general about specific advancements, like new versions of smartphones or new social networking sites. How much do you know about technology and the media? Take PEJ’s new quiz to find out. 1.General technology threads are the concepts or impressions that form around technology as a whole in a given story. For a story to be coded as containing a thread, it had to be prevalent in at least 25% of the story. 2.There were 953 technology stories in total over the course of the 13 months. PEJ staff then selected every other one in each program or newspaper, 437 in total, for further coding analysis. 3.Net neutrality is the concept that all traffic on the internet should be treated equally. Under the principle of net neutrality, internet service providers would not be allowed to favor certain sites or services over others.